In a shock and awe move that shook fans and tastemakers alike, Future and Juice WRLD aligned powers and have unleashed their collaborative album Wrld On Drugs via Epic Records, Freebandz Entertainment, Grade A Productions, Interscope Records and Sony Music Entertainment Australia. Listen now. 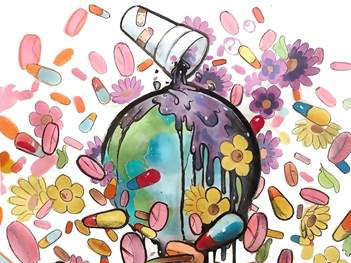 Bringing together two of the game's most unique and undeniable titans, Wrld On Drugs sits at the nexus of Actavis-drenched trap, soulful Southern hip-hop, and dreamy melodic transmissions. The duo first hinted at the project with the release of lead single 'Fine China'. Backed by glitchy production and airy drums, their voices entwine in an irresistible and inimitable psychedelic harmony as a hypnotic hook takes hold. Within four days, it clocked 13 million Spotify streams and 1.6 million YouTube/VEVO views. Its music video drops very soon! Immediately, the song ignited a firestorm online. HotNewHipHop praised it as "a poppy, melodic track," and Hypebeast wrote, "This track proves there's enough chemistry for more potential hits in the near future." Those hits comprise Wrld On Drugs. As a whole, the project represents a watershed moment for the culture. Atlanta's intergalactic king links up with the Windy City's rookie of the year to craft a blockbuster that defies categorization and comment. Close your eyes, kick back, and fall into Wrld On Drugs.